The Pick-5 wager at Pompano Park this past Monday finished with a total pool of over $145,000. Not too many years ago, $145,000 would have been right on par with the total handle certain nights at Pompano over an entire card. Granted, the Pick-5 pool was aided from the start by a double-carryover of $23,805 heading into the Monday card, but it needed an army to reach to reach the strong six-figure number that it did. More specifically, it needed the “#Senditin” army. Coined by its founder and Pompano track announcer Gabe Prewitt, the #Senditin hashtag has become a rallying cry for bettors and fans alike to join in from wherever they are and bet Pompano. The growing legion of people using that trending hashtag to interact with one another on Twitter form the #Senditin army, and it is evidence of a once cult following becoming more mainstream in harness racing social media circles. 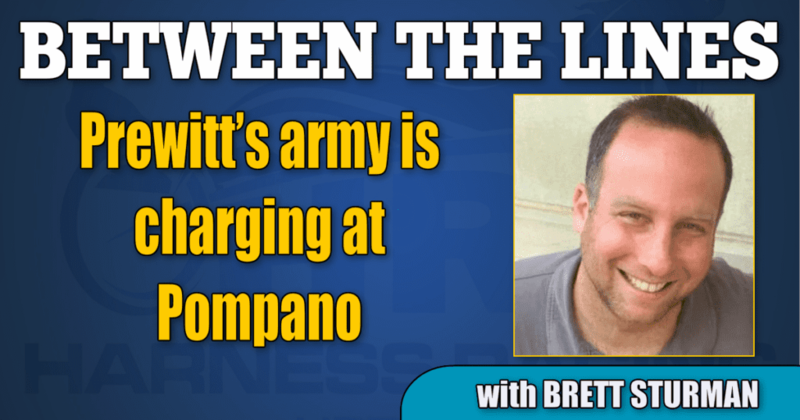 Hours in advance of the first race post time for the Pick-5 from Monday, Prewitt sent out a tweet calling on ‘FULL RESOURCES’ from the army to dive in and deliver a pool over the six-figure mark. Indeed, the loyal soldiers of the army came through, and it speaks to how far the social media growth has become. Prewitt describes the Twitter experience as a natural fit to why we’ve always followed racing. He says, “It’s like what all of us went through – or at least how I got hooked on the game – I went to the track and had the camaraderie and being around the guys there and learning from those guys who had been around and it’s almost kind of like that. It’s this genuine and fun interaction that Prewitt speaks to that is what drives the online following. “We do try to make it fun and try to give people things that they don’t always get to see,” said Prewitt. “If there’s a big ticket out there I’m usually trying to look it up to see where it came from, and other interesting things like that. We’ve been trying to make it fun and mix it up. And we’ve been gaining a lot of new people. Even my thoroughbred guys – they end up tweeting questions about this, that and the other, so it’s cool to kind of see it catch on and grow. And there’s no question that it all helps us in terms of exposure; the chatter and spread of the word – things like that are priceless. In addition to being fun, the Twitter following is funny. Within the #Senditin camp or anyone who interacts with Prewitt for that matter are characters from across the entire racing spectrum. There’s routine comedy, including for example a user who tweeted that in close finishes at Pompano, all ties must go to Wally Hennessey (Hennessey was put up the winner in the Monday nightcap where at first – and second glance – it looked like he just missed). Prewitt then responds in good-hearted fashion on the string of tweets take off from there. As far as I can tell, Pompano has the most devoted social media following of any track in North America. Unlike some tracks who try half-heartedly with sporadic “who do you like in this race” tweets, the Prewitt and #Senditin conversations contain legitimate and useful conversation. Bettors share their thoughts on the races and then post their tickets for others to follow along. All the while, Prewitt catches it all and makes it a point to respond to as many interactions as possible. Even with that said, the gamblers wouldn’t all be there if not for Prewitt himself in the first place. There are tweets from people who used to be thoroughbred people, and there are others that say Pompano has surpassed other fellow Monday and Tuesday night tracks as far as the track that will get most of their wagering attention. It’s no doubt at least in part due to the respect that the followers have for their fearless leader.